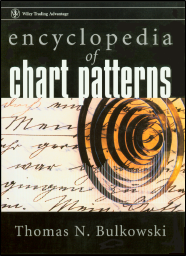 "Discover How Line Charts Bring Clarity To A Complex Market"
t's simple... line charts are the purest form of charting analysis. Using only the closing price, market behavior begins to take shape... revealing patterns and trends that can be traded for profit. Any market can be plotted using this charting technique. 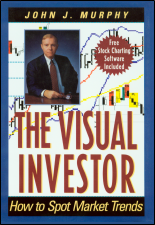 For some markets, like mutual funds, it's the only charting method available to display the NAV, or net asset value. First, line charts allow you to quickly determine the trend. 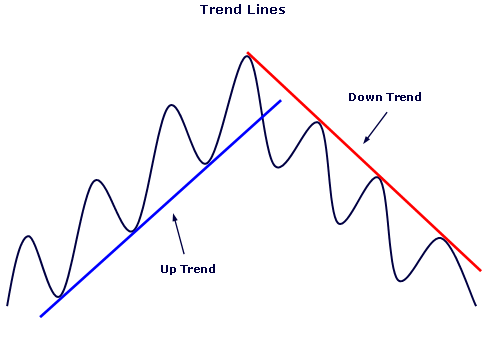 In an up-trend, a line is drawn under successive higher lows... forming a trend line. A trend line drawn across successive lower highs depicts the down-trend. Additionally, parallel trend lines can be drawn... forming a channel. The lines clearly define an up-trend or a down-trend. 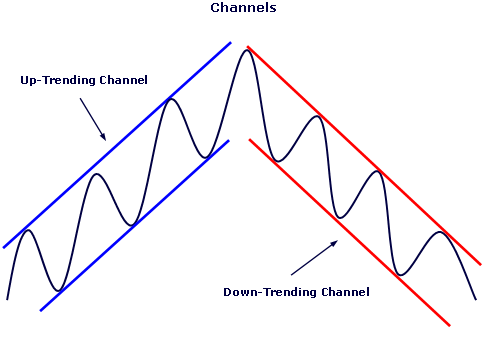 Use the channel as a guide for predicting short-term trend changes. The price action will follow the channel, bouncing from top to bottom and back, again. Sometimes, the price will move outside the boundaries of the channel. This is acceptable... as long as the channel contains the majority of the price action. If the price fluctuates too far, the channel will need to be re-drawn. "Line charts bring order to chaos..."
Next, horizontal lines are drawn in order to depict areas of support and resistance. With line charts, the price does not always touch the line. So... determining areas of support and resistance may be more of an art than science. Notice, once the price breaks through resistance that area tends to become an area of support. And... the opposite is true. 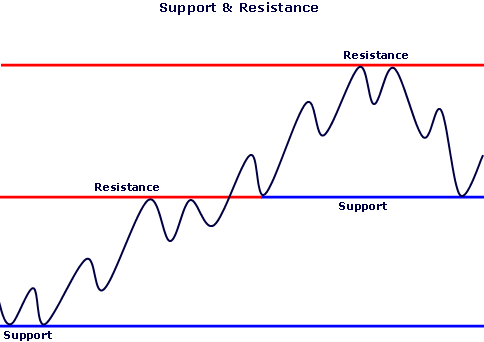 What was once support, becomes resistance. Finally, line charts quickly reveal areas of congestion called triangles. There are three types of triangles: ascending, descending and symmetrical. 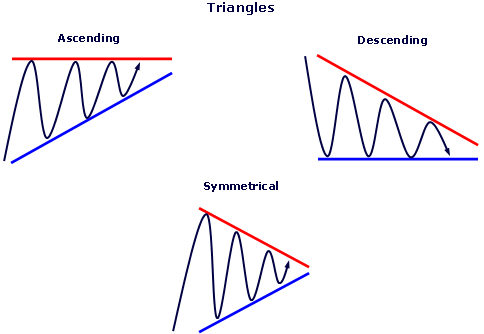 How the price fluctuates within the pattern determines the type of triangle. Imagine a coiling spring, where the price oscillates in a wide range - gradually, narrowing to an apex or point. It's at this point, the tip of the triangle, where the price breaks-out... typically in an explosive move up or down. 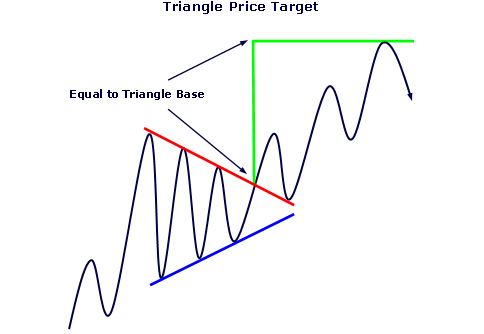 Triangles have a hidden benefit... they forecast price targets! Measure the length of the triangle base and add it to where the price breaks out of the triangle pattern. You'll be surprised how often this short-term target is reached! Line charts are a simple way to quickly get a feel for a market's rhythm and direction. Applying trend lines, channels and triangle patterns may help you discover the next big move!